Every Facebook user who can speak or understand Luganda must have wondered what it would look like in the local language. 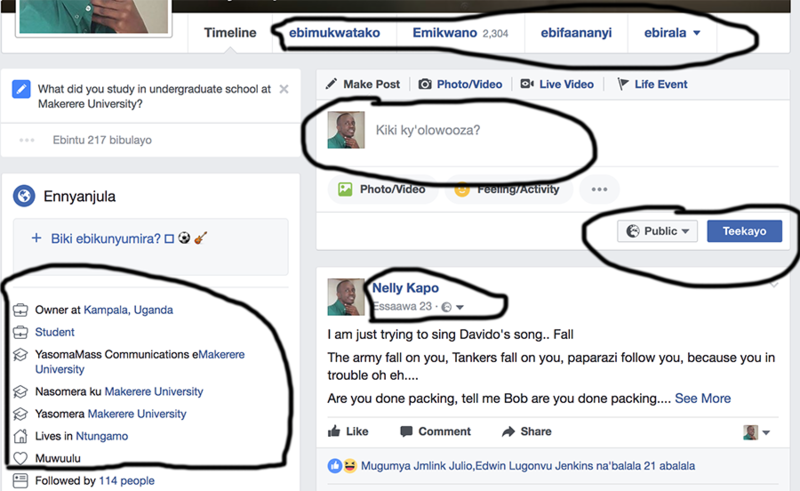 Several people have made jokes about what Facebook would refer to when indicating certain actions, for instance; One user wondered what blocking would translate to should Facebook turn to Luganda and well the answer he got for himself was; Akukubyeeko ekibaati. Well wonder no more, from today onwards you can use your Facebook in Luganda. And well, nothing much has been changed as most things have been directly translated. Photos for example in the Luganda Facebook are called Ebifaananyi, your information- ebikukwatako, others- Ebirala and then the what’s on your mind is kiki kyolowooza? To post- Tekaayo, all dates are in Luganda, and activity in Luganda will be- byo’obade okola. Notifications is okutegezeebwa. The most interesting bit as you will all find out is relationship status under profiles, this write has his showing; Muwuulu for single. Unfortunately for other local languages, you will have to wait. How do you turn to Luganda? When you go to your account settings, click on language and choose Luganda.